What is the Student 49er Club? 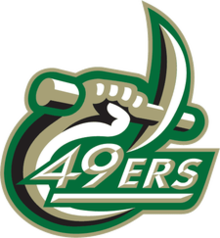 ​Student 49er Club is a student organization on the campus of The University of North Carolina at Charlotte. The primary focus of Student 49er Club is to involve students in an excitement-oriented organization that is committed to supporting and promoting all Charlotte 49er athletic programs. One of our goals is to spread school spirit and pride throughout the campus and city of Charlotte. More importantly, it is our goal to educate Charlotte students on the importance of giving back to the 49er Club after graduation to support Charlotte 49er Athletics for a lifetime. We are proud to be one of the largest student organizations on campus and strive to be the finest student-athletic organization in the country.